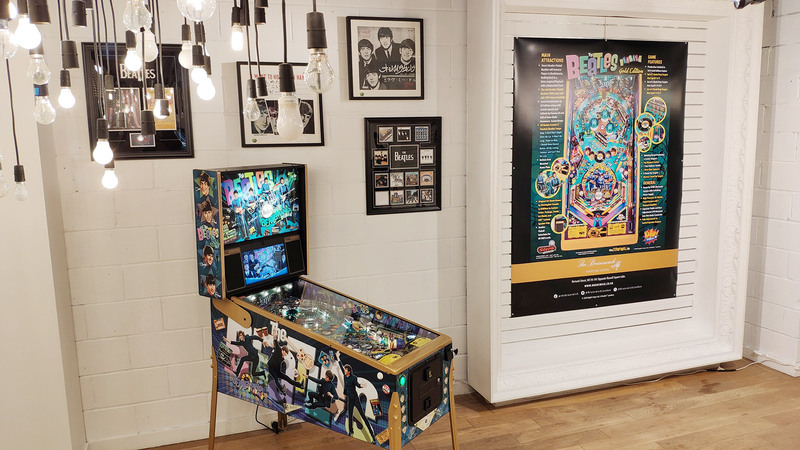 In the first event of its kind, Stern Pinball and Ka-Pow Pinball’s latest collaboration – The Beatles: Beatlemania Pinball – is the star of a brand new pop-up store in central London. 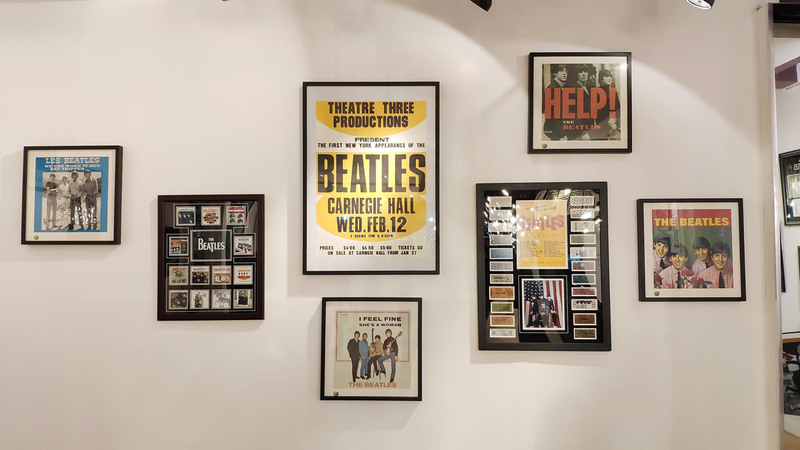 The store is part of the recently-refurbished Brunswick Centre in Bloomsbury, an area with a strong Beatles connection after the fab four spent the summer of ’63 living in The President Hotel which is just one block away from the Brunswick Centre. Inside are four brand new The Beatles pinballs – all Gold Edition models – surrounded by Beatles artwork featuring posters, album covers and advertising flyers. 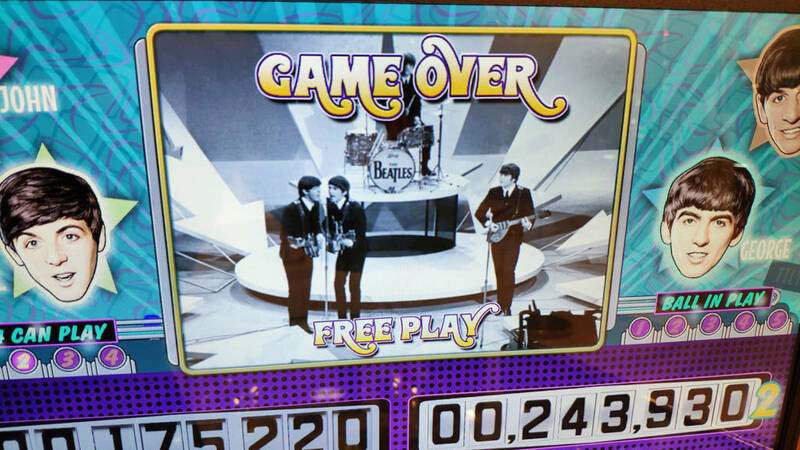 There is no charge to enter and all four games are set on free play. 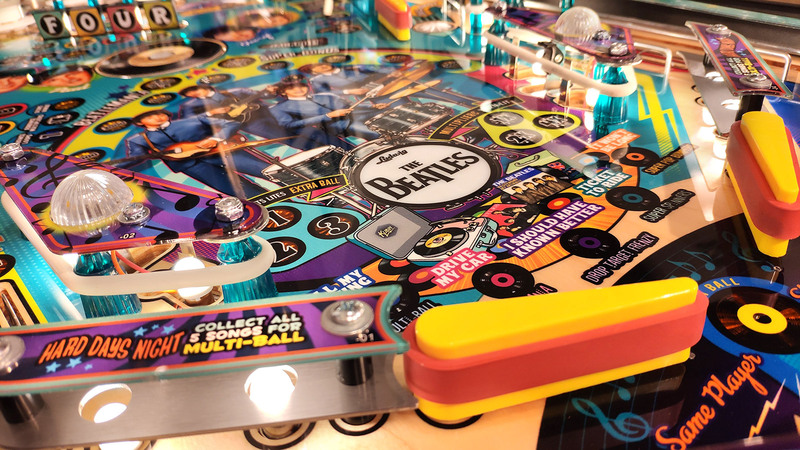 The aim with this unique setting is to encourage non-players to try pinball for the first time or to rekindle the pinball bug in former players, using the Beatles theme as a hook. 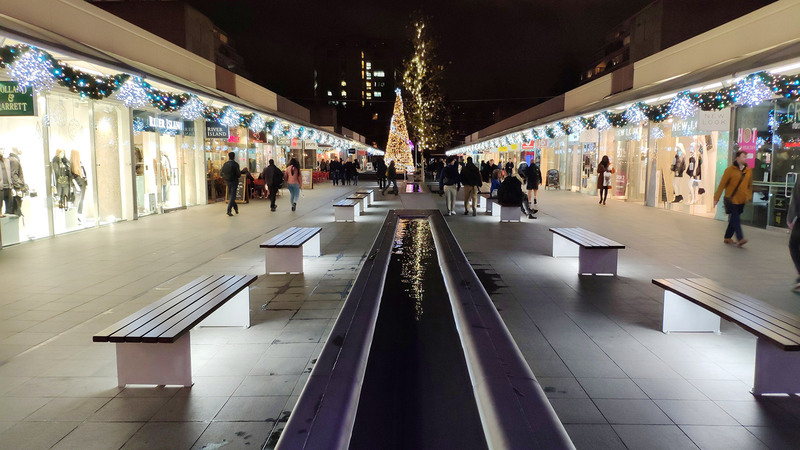 It seemed to be working, as visitors to the Brunswick Centre wandered in to admire the new attraction and play a few games. 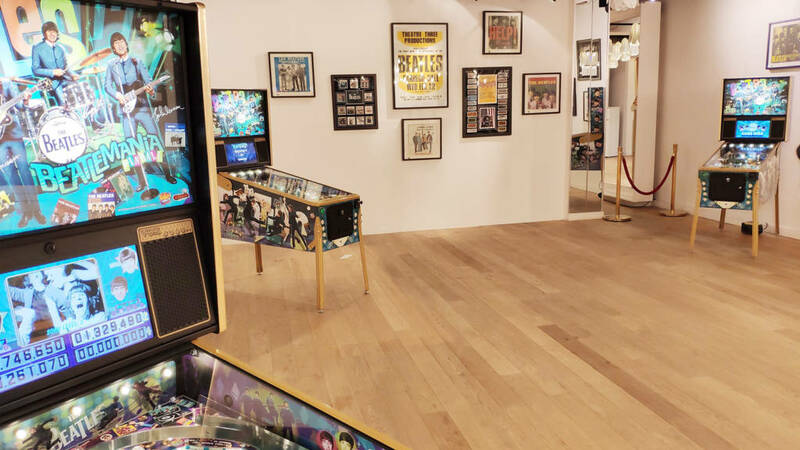 The pop-up store is the idea of John Stergides, owner of Stern Pinball importer and distributor, Electrocoin. 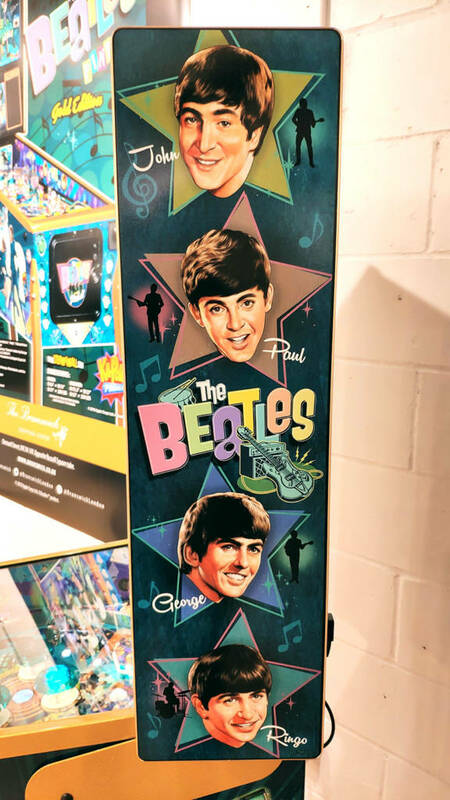 John was closely involved in negotiating the Beatles licence with Stern, Ka-Pow and the rights-holder, Apple Corps., and has teamed up with Apple Corps. 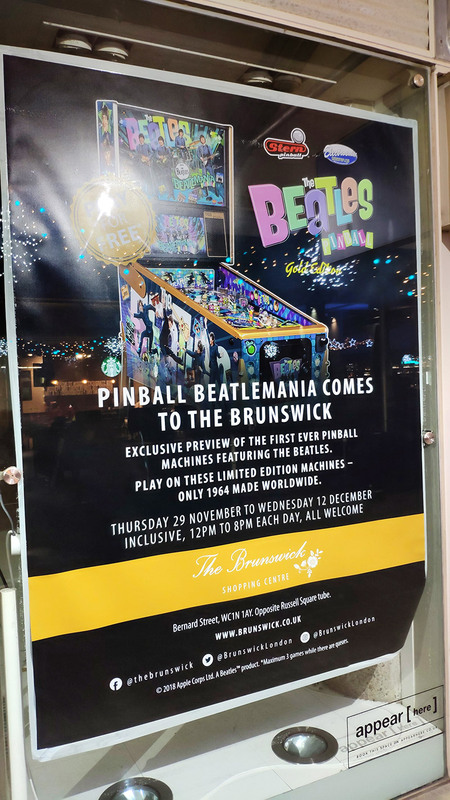 and the Brunswick Centre to create the store, with all the Beatles memorabilia coming from Apple Corps. 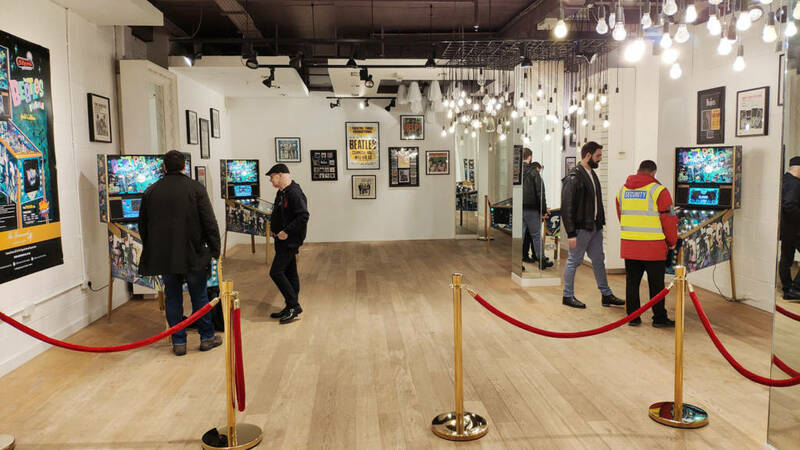 The overall impression is more like an upscale art gallery than a shop or an arcade. We arrived around 7pm on Thursday, the store’s first day of opening. 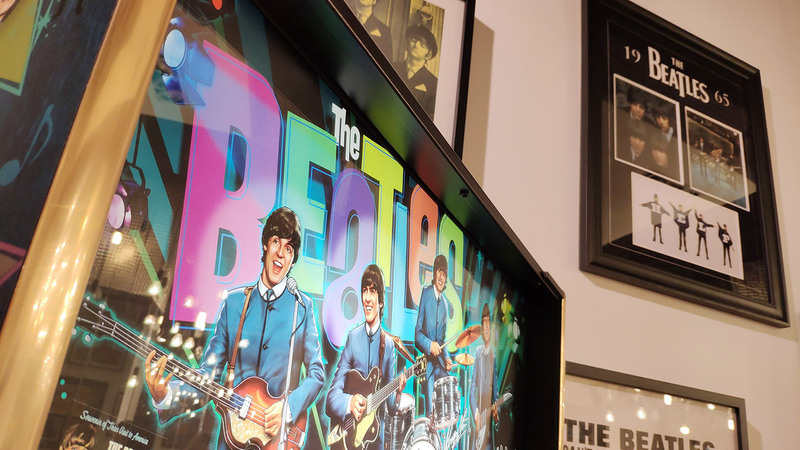 With one hour left until closing time things were relatively quiet in the Centre and in the Beatles store, but with advertising posters in windows around the complex things are going to get busy as we head towards the weekend. 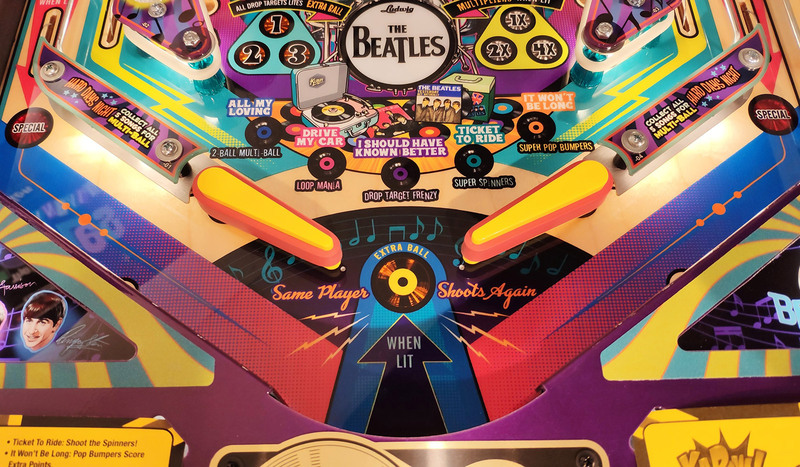 Visitors are free to play the machines for as long as they wish, but are requested to restrict themselves to three games during busier periods. 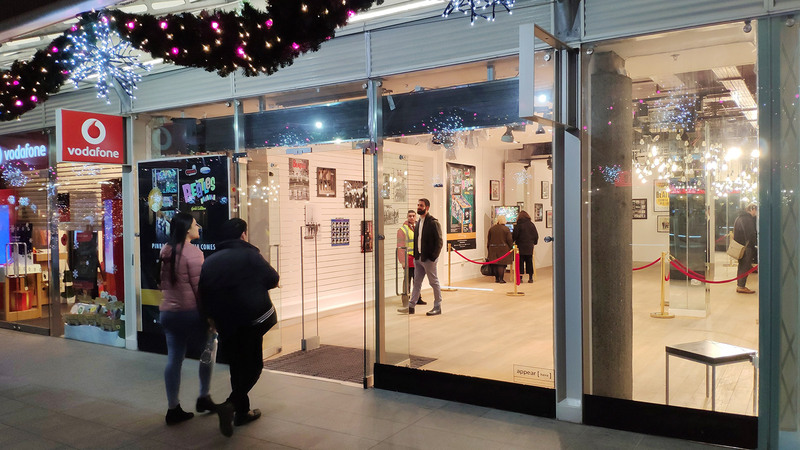 The pop-up store is open from midday to 8pm each day, until 12th December, 2018. Electrocoin or Brunswick staff will be on hand throughout to answer any questions, help new players discover the game, and handle sales enquiries. 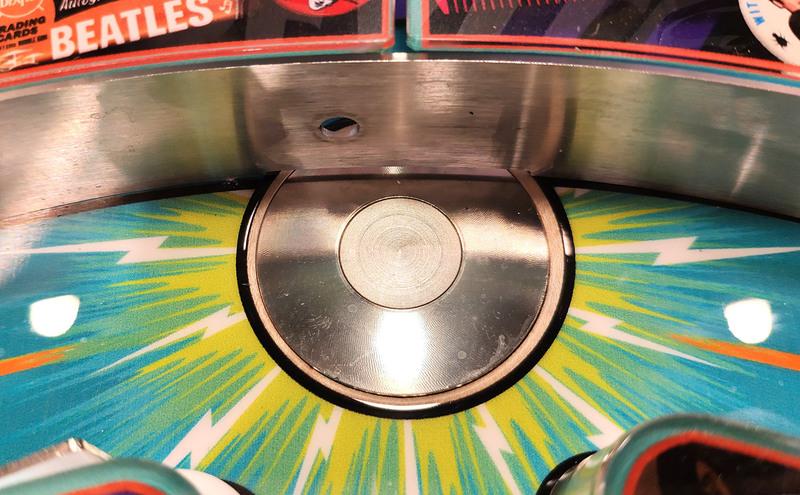 There was much talk initially about the lack of any coin slots on the machines in the promotional pictures. 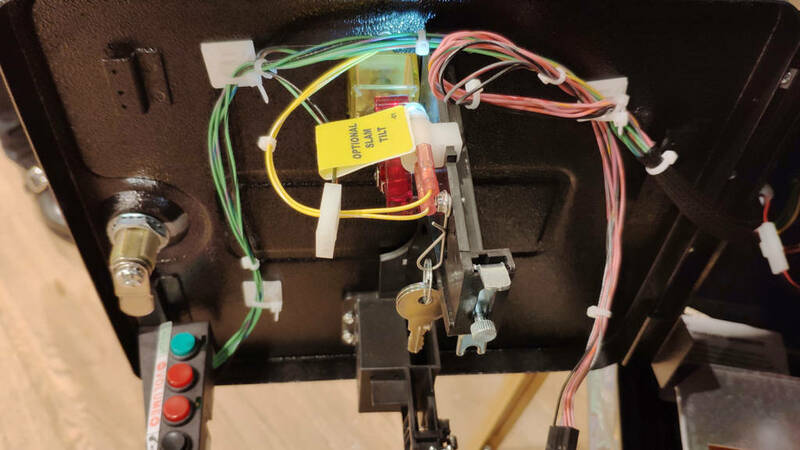 However, the game can be purchased with either a multi- or single-slot door as usual, or with a plain door if that is preferred for home use. Inside, the mechanics and electrics are all very familiar. 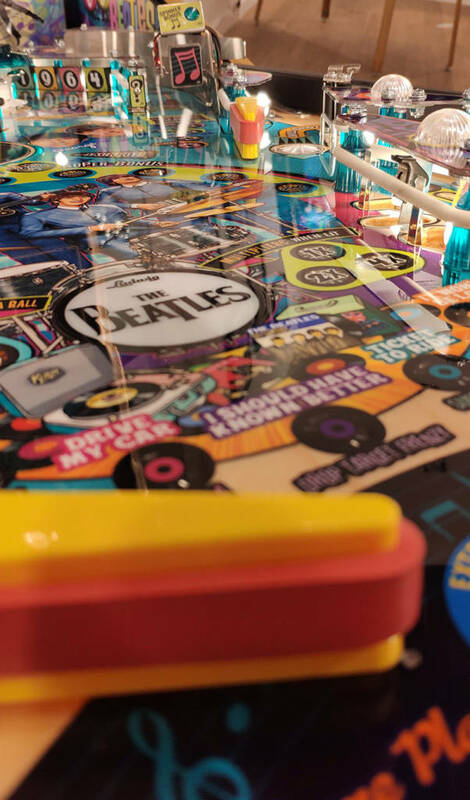 The game features traditional slide rails under the playfield but clips on the lock bar. 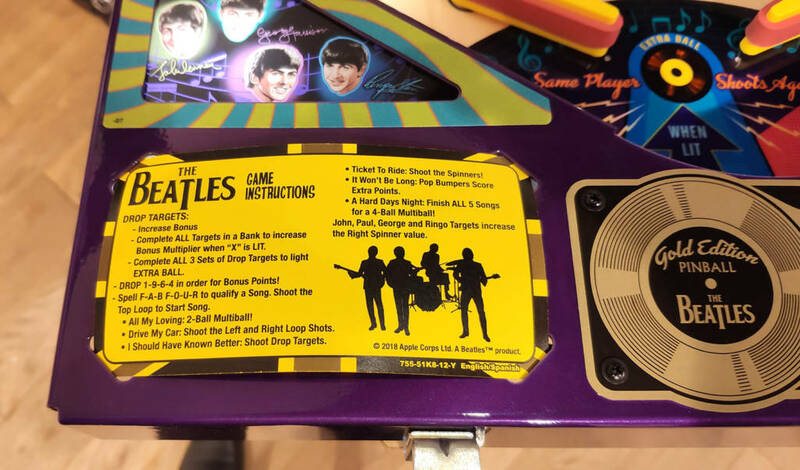 The game comes with a full printed manual, as well as a selection of spare plastics, two outlane post rubbers and assorted information sheets. 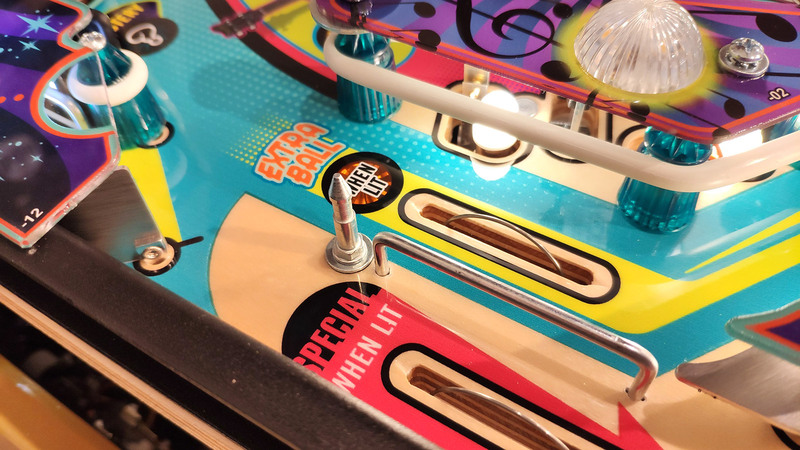 On the opposite side, we have the manual ball shooter rod and the button for the right flippers. 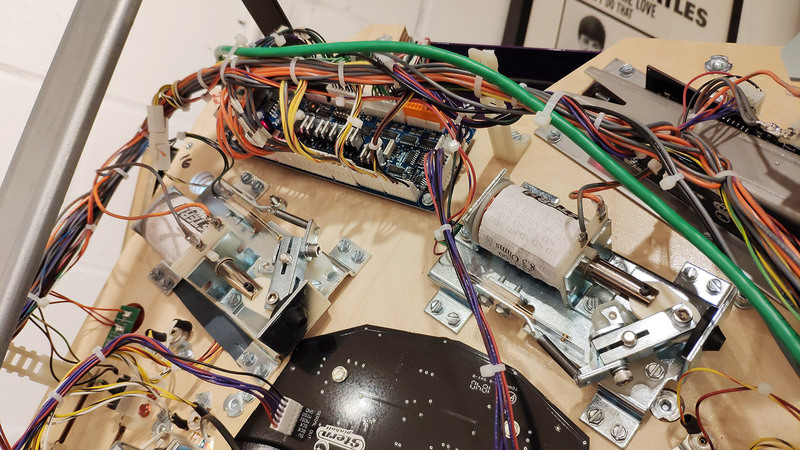 As with all modern Stern games, there’s not a lot in the cabinet, with the power supplies and control boards tucked away in the backbox. 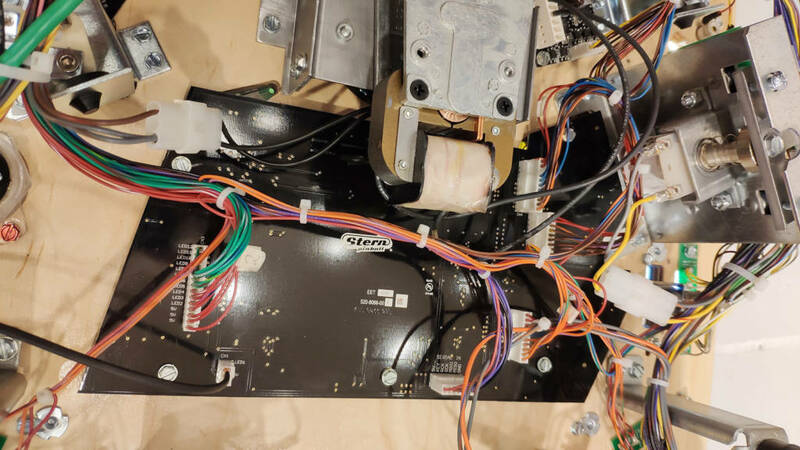 Turning to the playfield, let’s take a tour of the features and shots, starting at the bottom with the two main flippers. 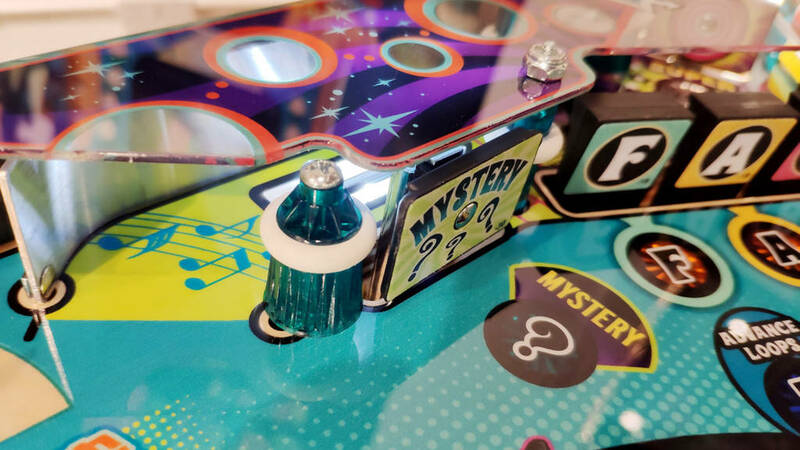 While white flipper bats may have been more in keeping with the retro feel of the machine, the yellow ones do match the yellow accents used in the playfield and apron artwork. 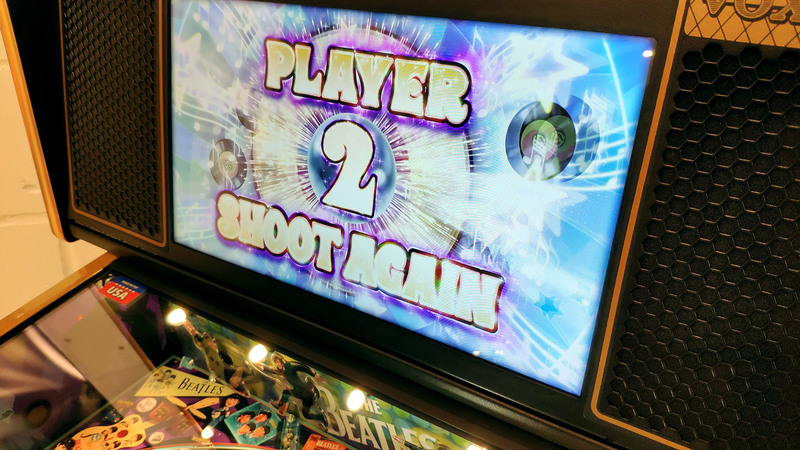 An orange Extra Ball insert recalls the ‘Same Player Shoots Again’ phrase in the first of many nostalgic throwbacks found in the game. 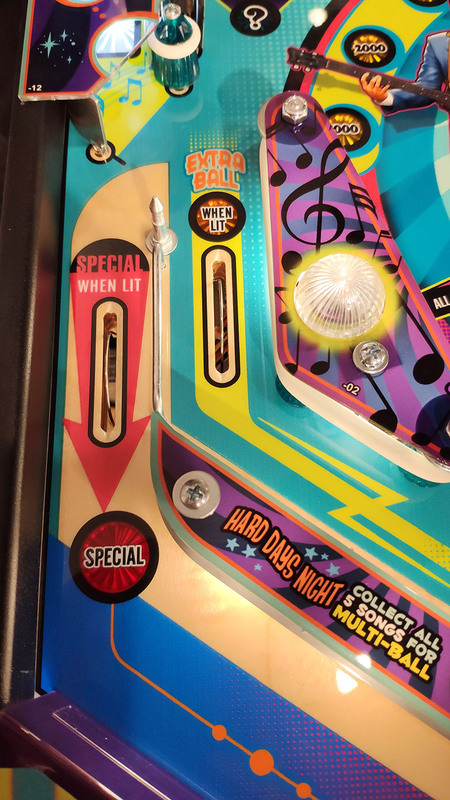 It is lit solidly when an extra ball has been collected and flashes when the ball saver is active. 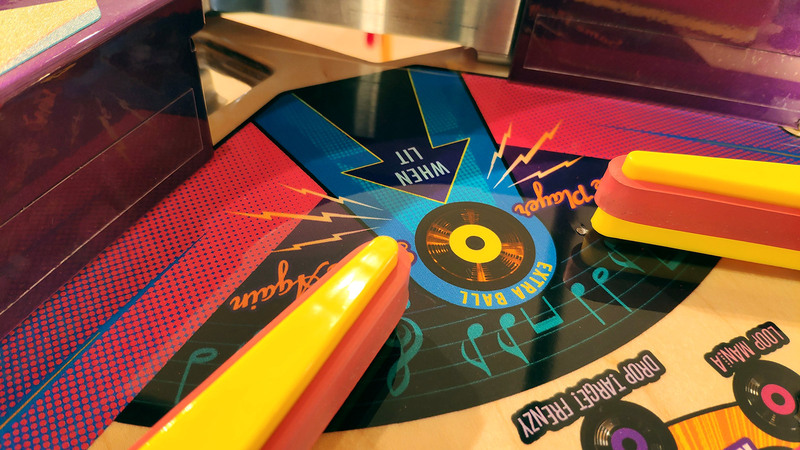 There is no centre post option on the game, so once the ball passes the flippers it is destined for the drain. 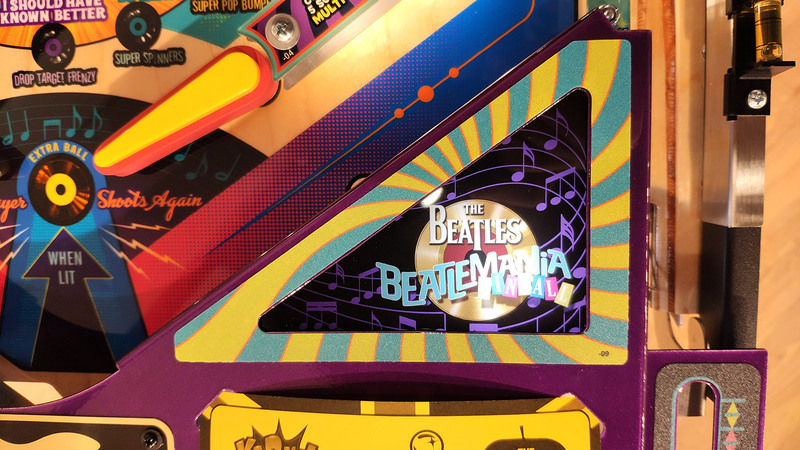 The game features several instances of awards being prominently printed on the playfield, with the inlanes and outlanes being two more examples. 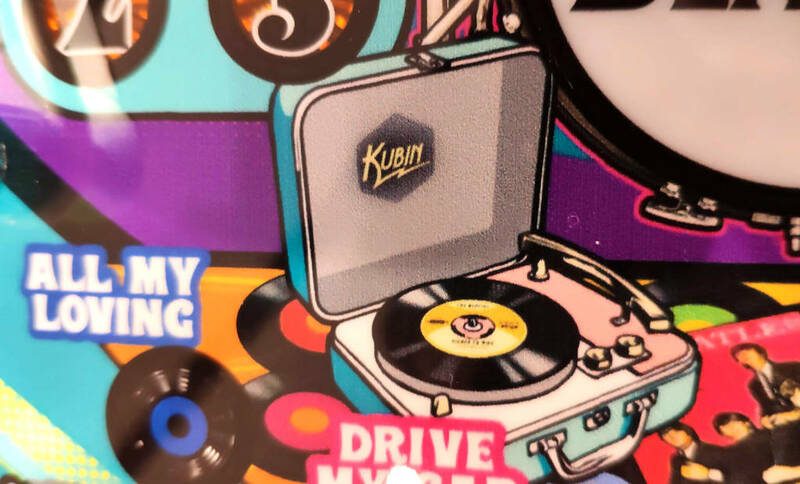 One of the two rubber post rings supplied in the goodie bag goes on the post in the picture above. 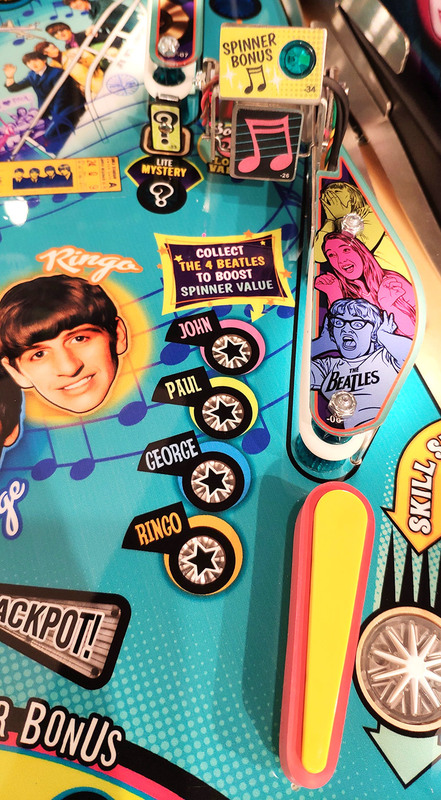 The slingshots in The Beatles are very plain, single-level affairs using the turquoise colour posts used throughout the game, with a small flasher dome mounted on top. There’s really not much more to say about them, so we won’t. 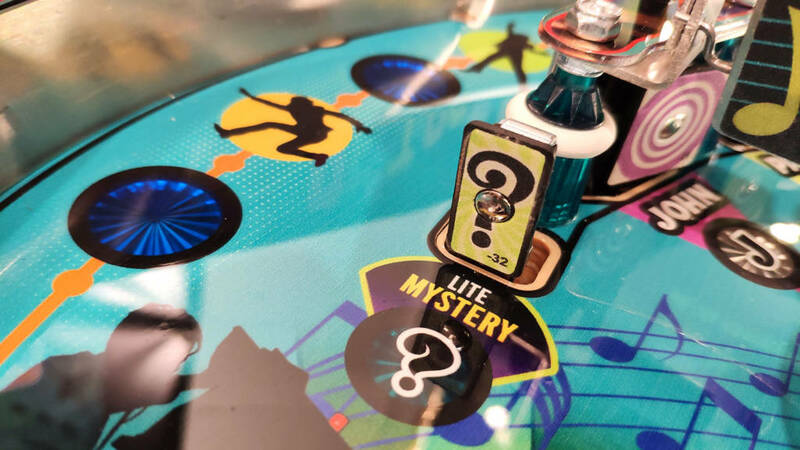 Just up from the left inlane is the first stand-up target in the game which gives a mystery award when lit. There is a lane behind the mystery target which exits into the left inlane. 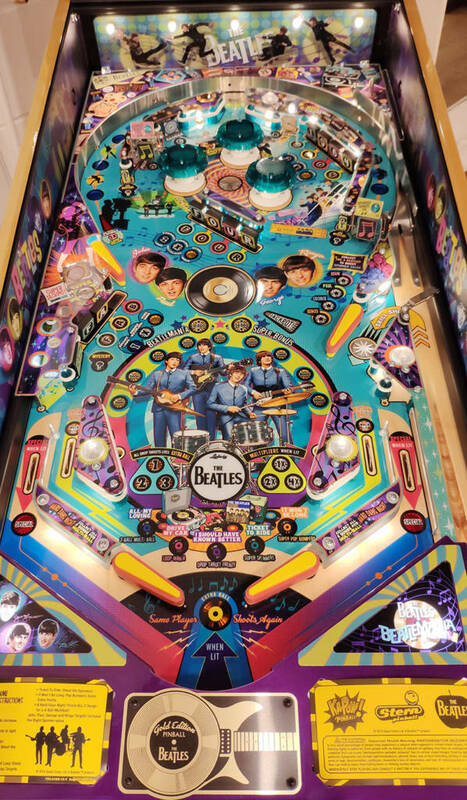 It terminates with a sharp-looking flat rail which looks as though it could chew up the ball somewhat. The lane is accessed by knocking down the first of three drop target banks in the game. 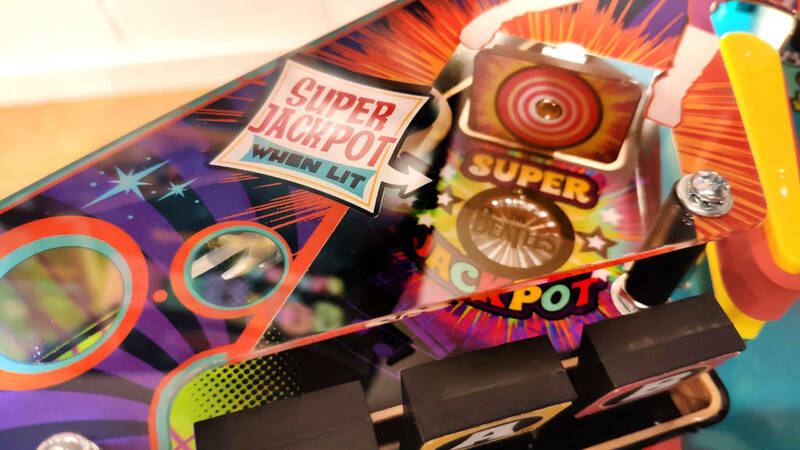 When the targets have been knocked down, the super jackpot standup target behind it can be accessed. Shots to that will normally roll down and exit through the lane we’ve just seen, although it can also bounce out over the drop targets. 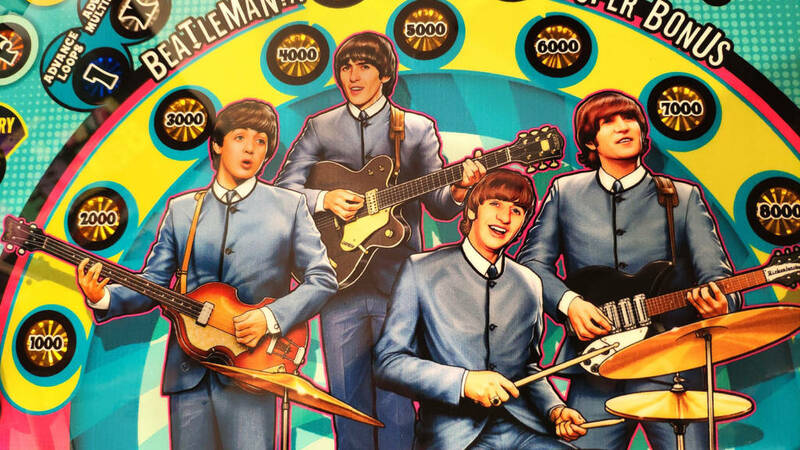 Rather than trying to associate certain targets or lanes with Beatles-themed items, places or events, this target is just a Super Jackpot target. Moving on up, we come to the first of two upper flippers. 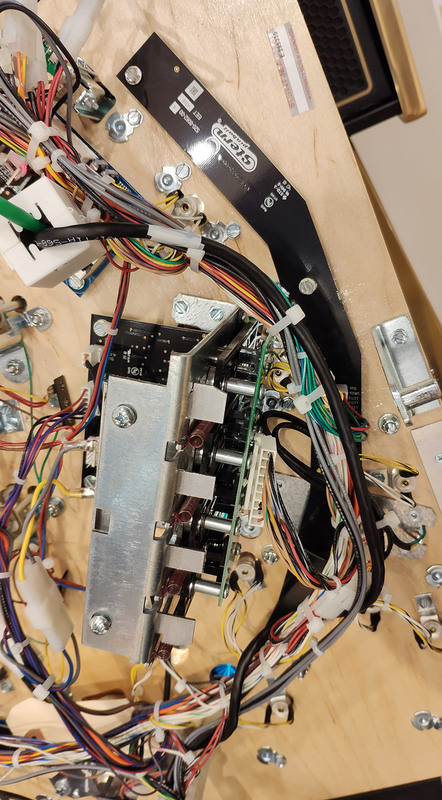 This has several shots, with the main ones being into the pop bumpers and into the second bank of drop targets. 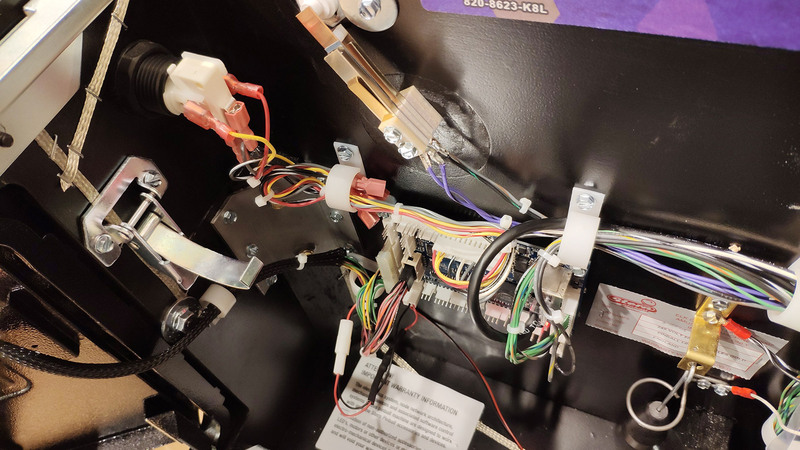 Like all three banks, this one can be lit for either an advance towards completing the orbit lane, adding a bonus multiplier or increasing the bonus. 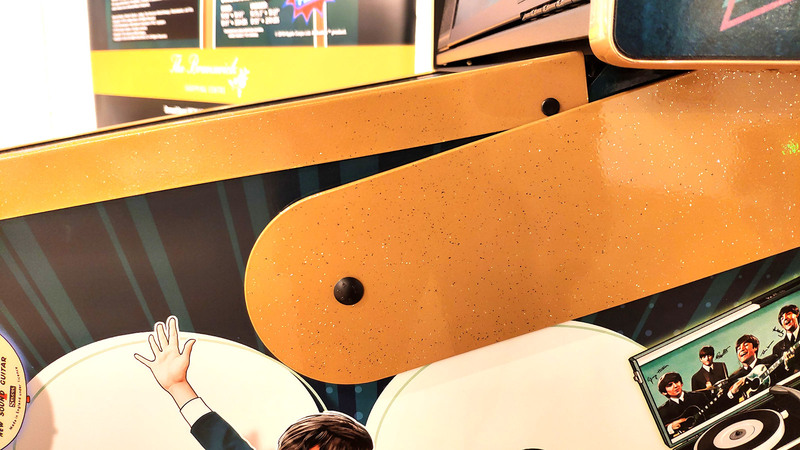 The current award is shown on the inserts in front of the bank. 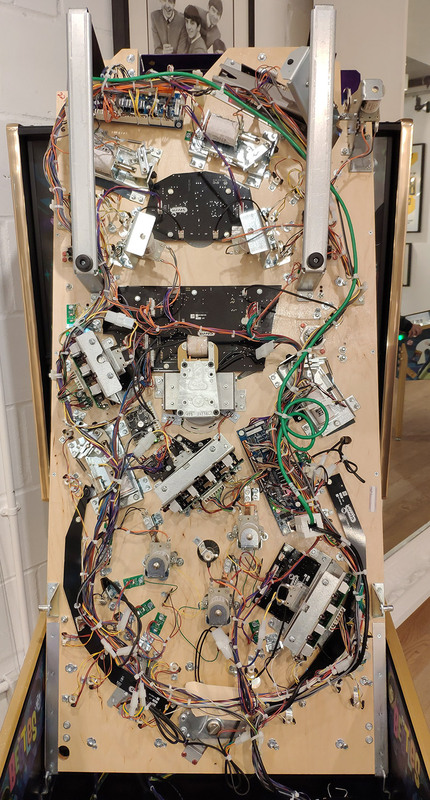 To the left of the upper-left flipper is the left orbit entrance. 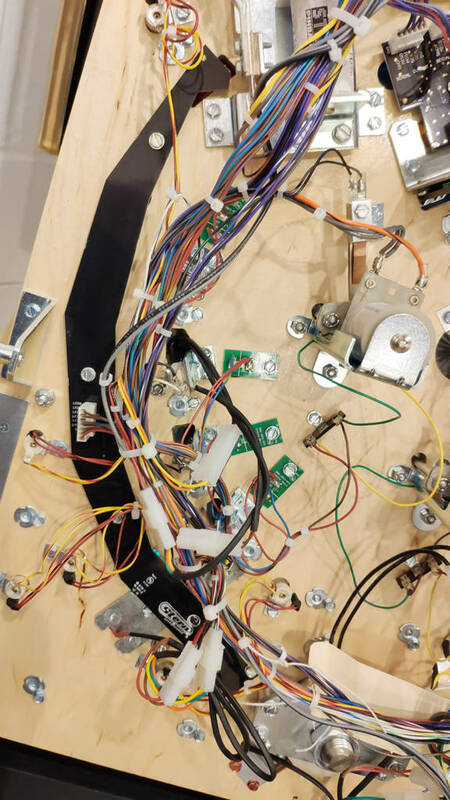 This takes the ball round to the top of the playfield from where it can either continue round the orbit lane, or it can be grabbed by a magnet. If the magnet grabs the ball, a display effect is played and then the ball enters the pop bumper area. 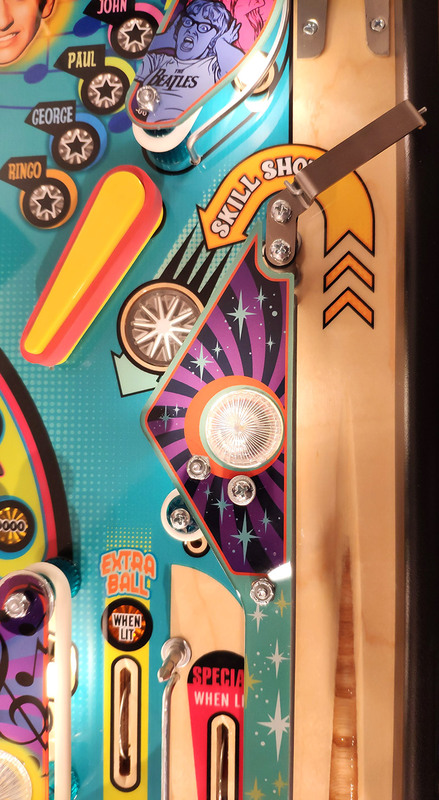 As with the original Seawitch design, the ball bounces around here and hits various targets. 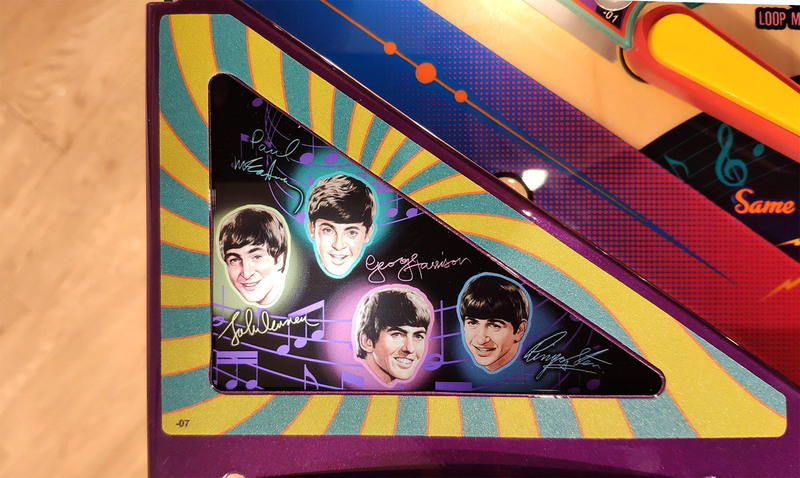 In Seawitch they were all stand-up targets, but in The Beatles it’s a mix of stand-ups and drops. 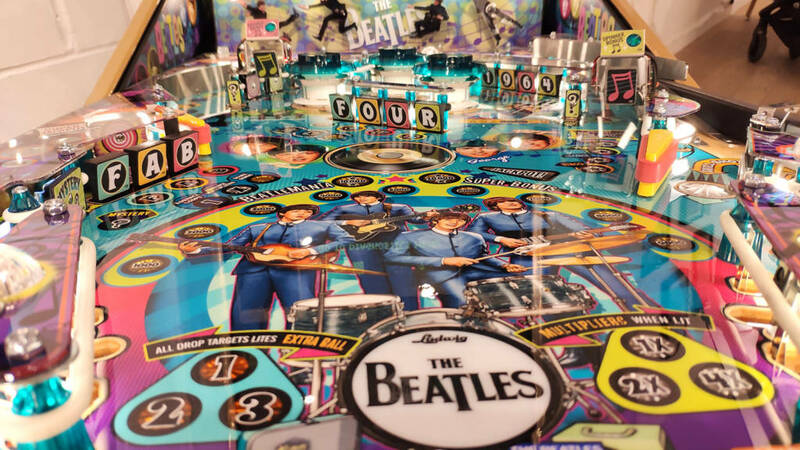 There are four stand-ups for John, Paul, George and Ringo, plus four drops for 1-9-6-4. 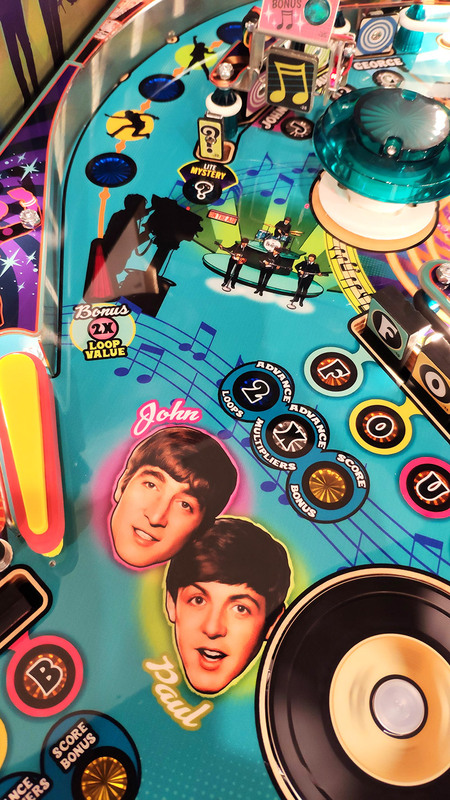 As well as lighting up their respective inserts in front of their targets, the fab four are also shown on four inserts lower down the playfield, next to the upper-right flipper. 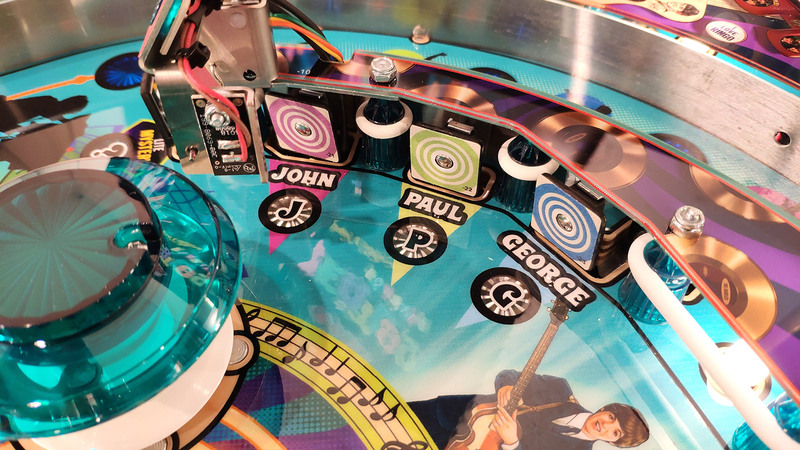 The ball can be shot into the pop bumper area from either of the lower flippers too in order to hit the John, Paul and George targets on the left, or the Ringo and 1-9-6-4 targets on the right. Those two shots are either side of the F-O-U-R target bank, and those are also the exits from the pops. Continuing on our tour, on the right side of the left orbit entrance is the first of two standup targets which light the mystery award. 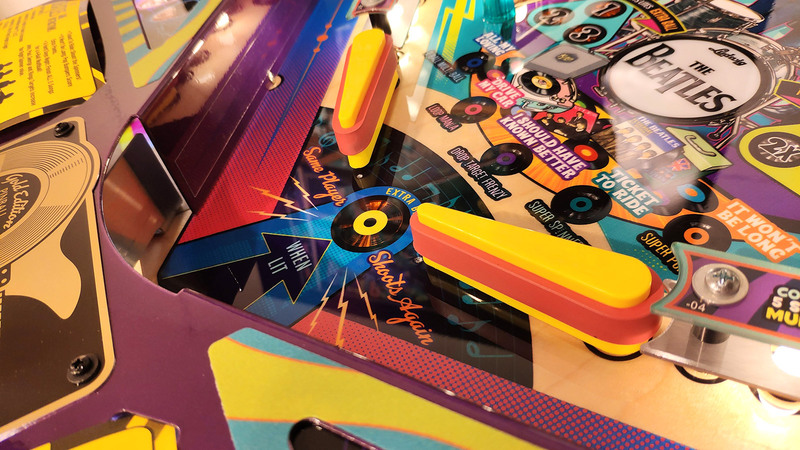 The left entry into the pop bumpers also features the first of the game’s two spinners. There is a corresponding one on the right side, but this is over the right orbit lane rather than the pop bumper area entrance. 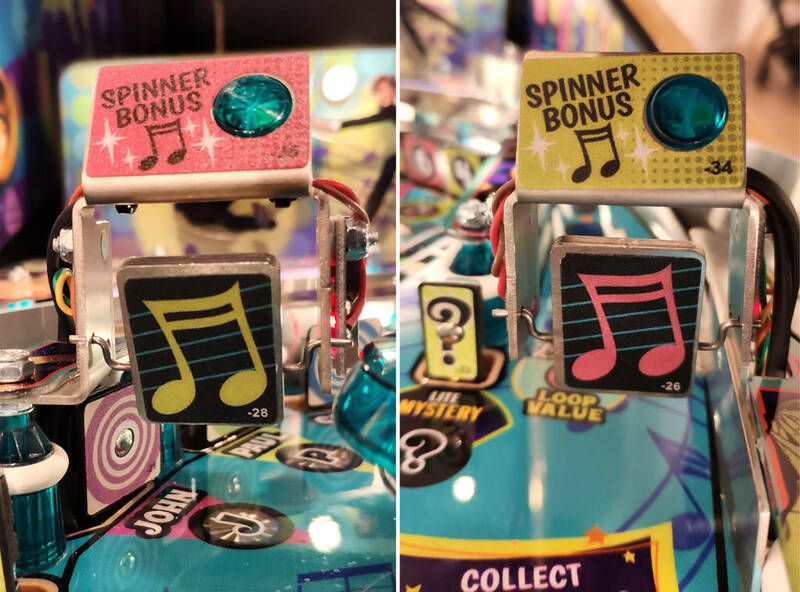 Normally there’s not much to say about spinners, but these are interesting because they recreate the near-frictionless spinning found on Stern Electronics games. Most modern spinners use a microswitch to detect spins. 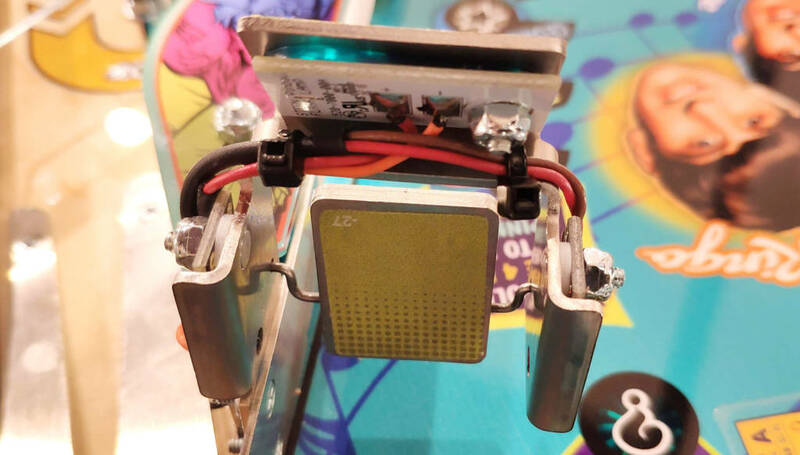 These microswitches require a certain amount of pressure to activate, and that pressure takes the energy out of the spinner, resulting in it quickly slowing down. 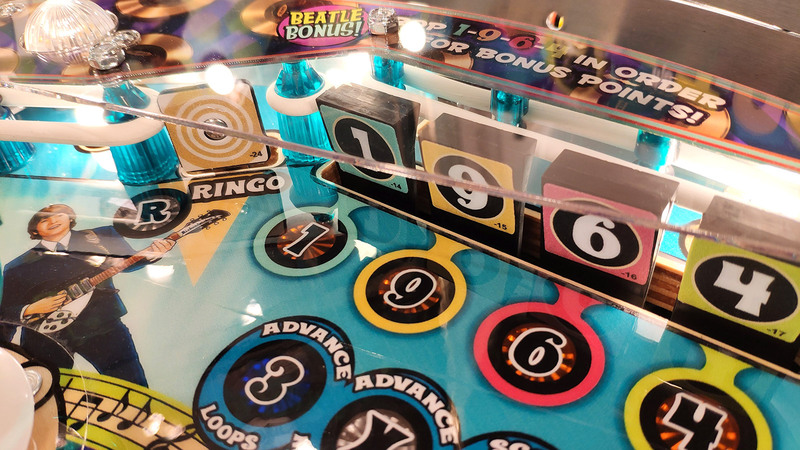 The spinners used in The Beatles are optical ones, using optos mounted behind the spinner to create a beam which is broken by the spinner as it turns. 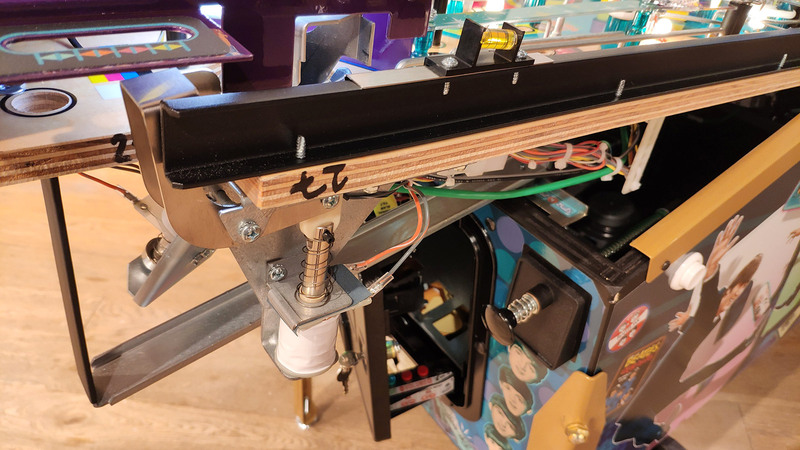 It’s not the most elegant-looking and could benefit from some kind of cover to hide the opto boards, but it certainly produces a free-spinning spinner which is satisfying to shoot. On the left side of the right orbit entrance is the second Mystery stand-up target. Hitting both of these lights the Mystery stand-up just above the left outlane. Just below the right entry to the orbit lane is the upper-right flipper. 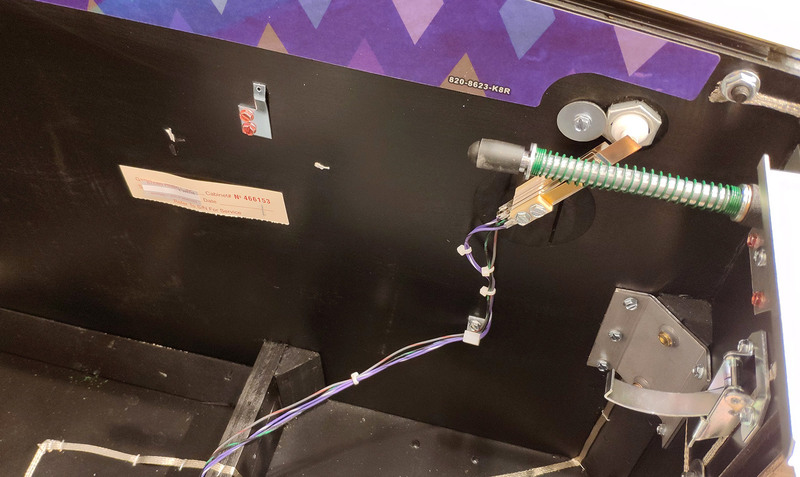 This flipper can shoot the F-A-B drop targets and sweep the F-O-U-R targets too, but its most satisfying shot is into the left orbit entrance which loops back to the flipper for repeat shots. The accompanying sound and lighting effects are a little lacklustre at the moment but that will probably improve in later software updates. To the right of the right slingshot are the in- and out-lanes which mirror those on the left side. Which takes us back to the lower flippers. 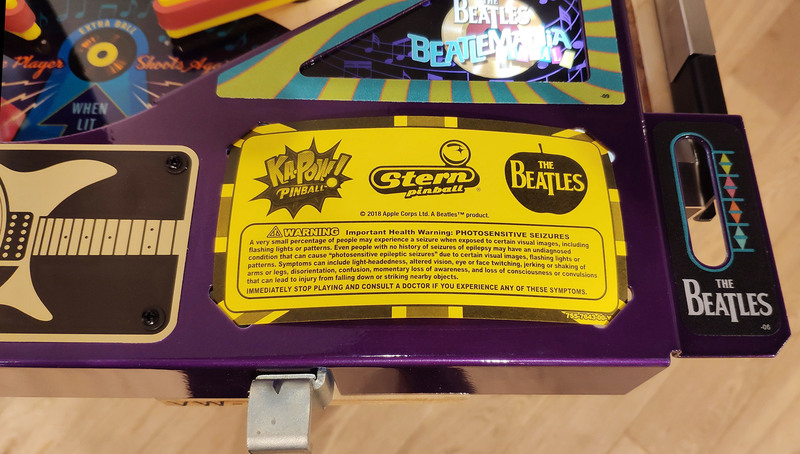 Above these flippers are the inserts showing the current song mode, any completed ones and any songs remaining before all five are played and Hard Days Night Multiball can begin. There are also two groups of three inserts. 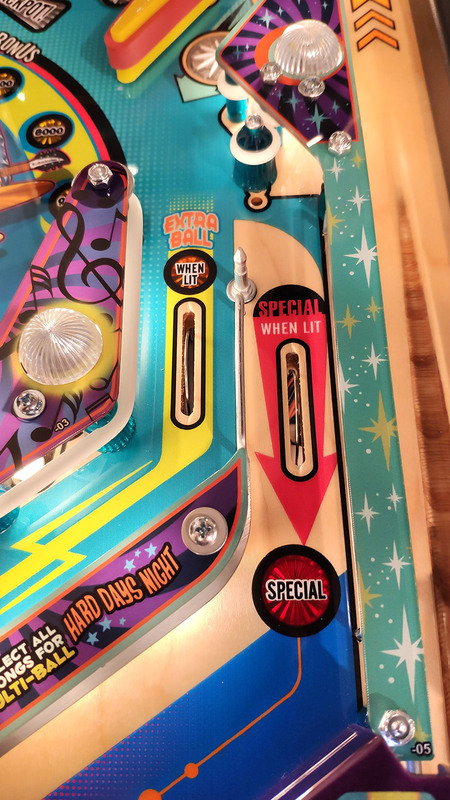 The left ones show your progress completing the drop target banks towards lighting the extra ball on the inlanes, while the right ones show your bonus multiplier. 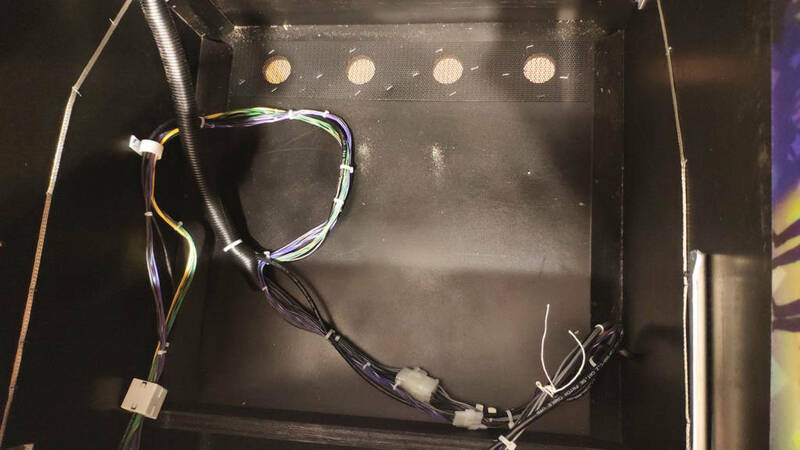 This uses the binary 1x-2x-4x system, allowing a maximum of 7x when all three are lit. 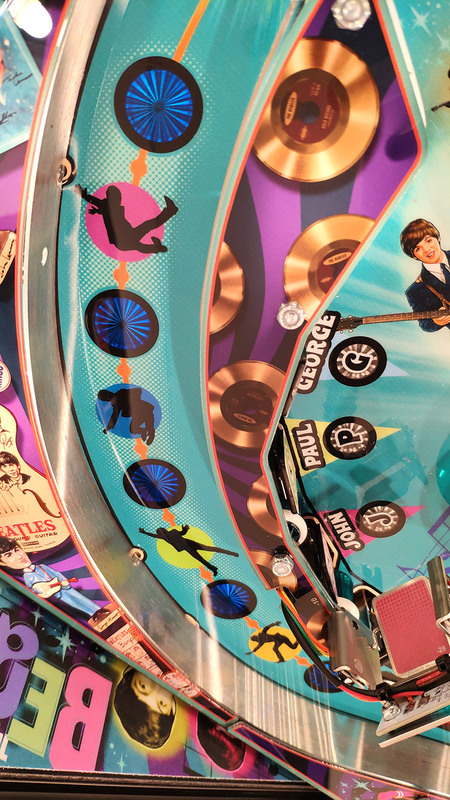 The bonus value itself is shown on an arc of insets in the centre of the playfield. 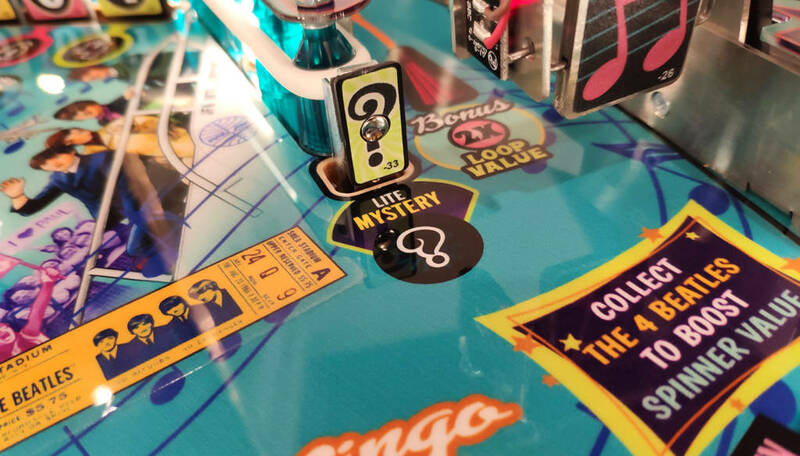 With the current code the bonus is not a major factor in your score, making the multiplier level not something worth shooting for specifically. 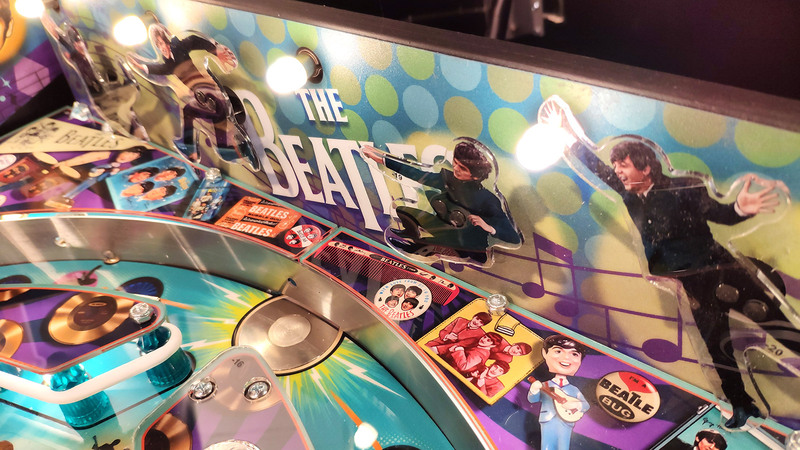 Above this is probably the biggest playfield difference between The Beatles and Seawitch – the spinning disc. 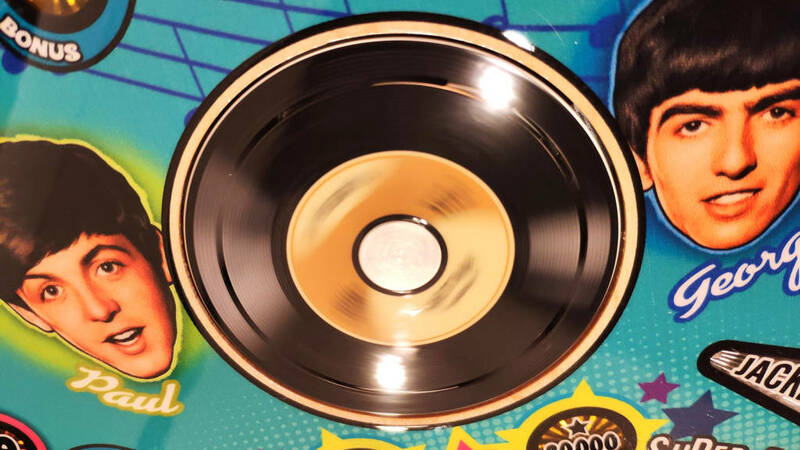 Looking like a spinning 45 record, the disc features a magnetic core in the centre and slots which allow a flasher below to shine through. 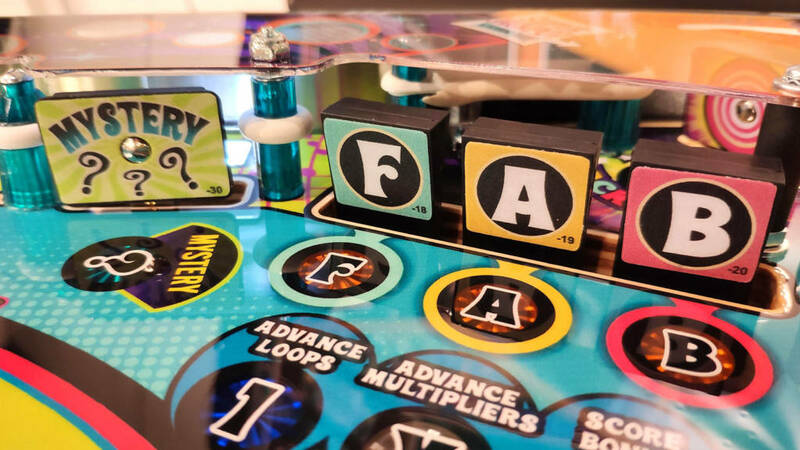 The current software does allow the ball to be grabbed, but doesn’t really do anything much with it once it has it. 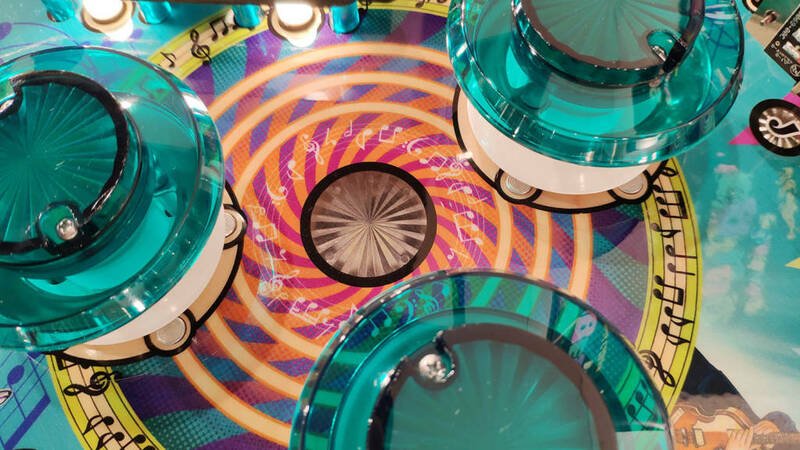 It doesn’t seem to do any Twister-like effects where multiple balls can be held and then spun-off in random directions. 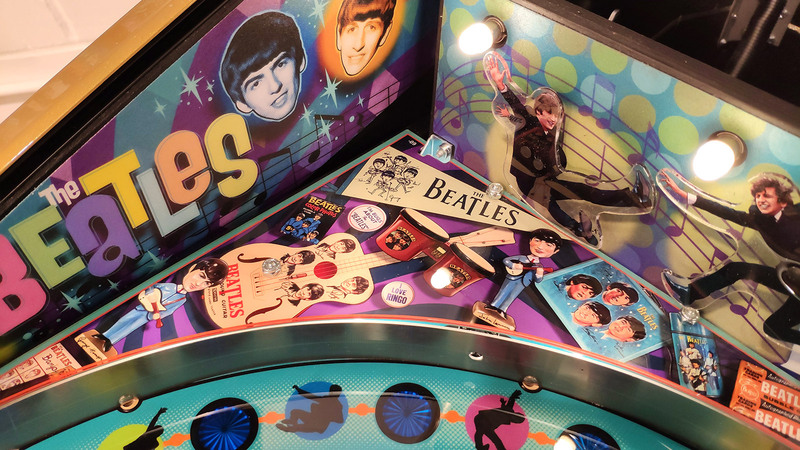 We say ‘multiple balls’ because – again, unlike Seawitch – The Beatles is a multiball game, holding four balls in the trough and using them all for the Hard Days Night Multiball mode. 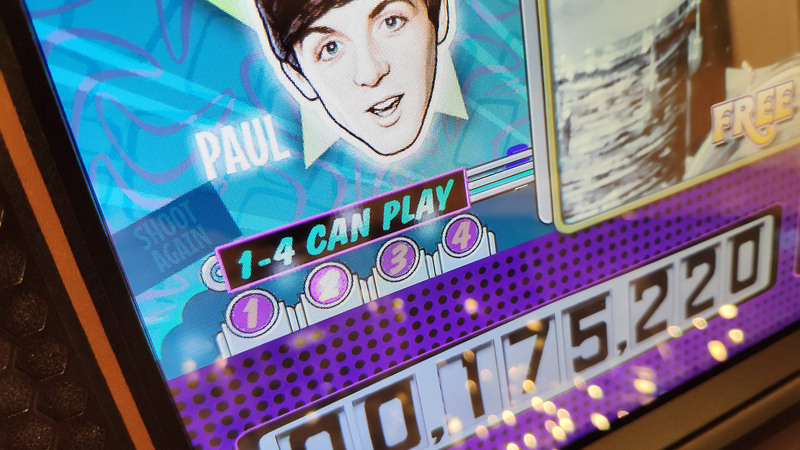 That’s our look at the playfield. 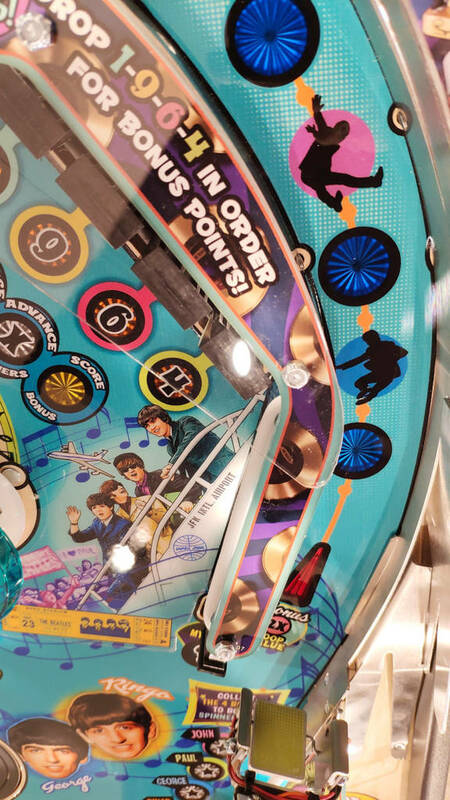 Down on the apron there are some illuminated decals as well as the usual instruction card and the game edition plaque. There is no pricing card installed by default – another licensing issue – but that’s easily overcome. 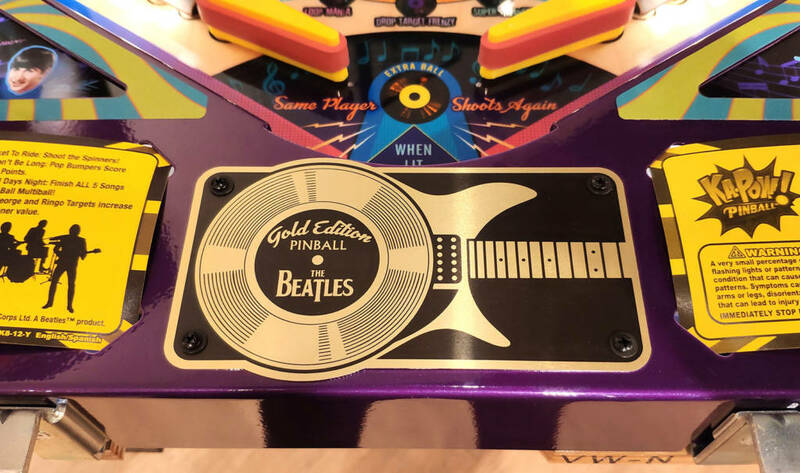 The Gold Edition games are not numbered despite having a limited run. The Platinum and Diamond ones are numbered though. 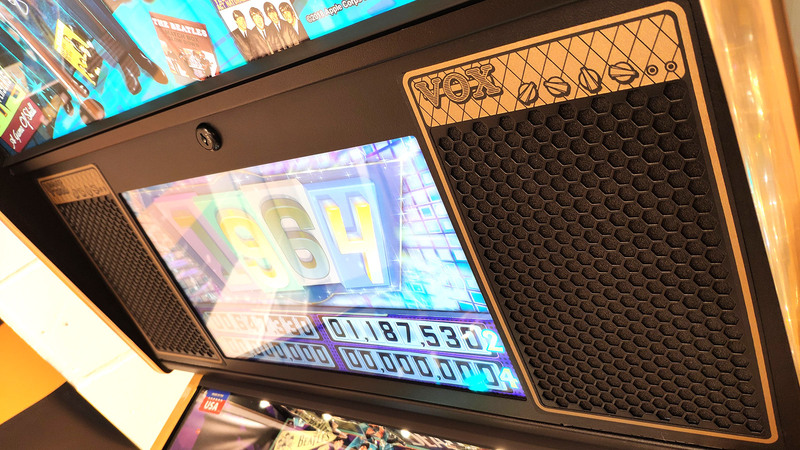 Up in the backbox, the game has the now-standard LCD panel with a pair of speakers. This Gold Edition game has gold-coloured speaker decals, gold backbox trim and gold speckled metalwork on the hinges, side rails, legs and lockbar. 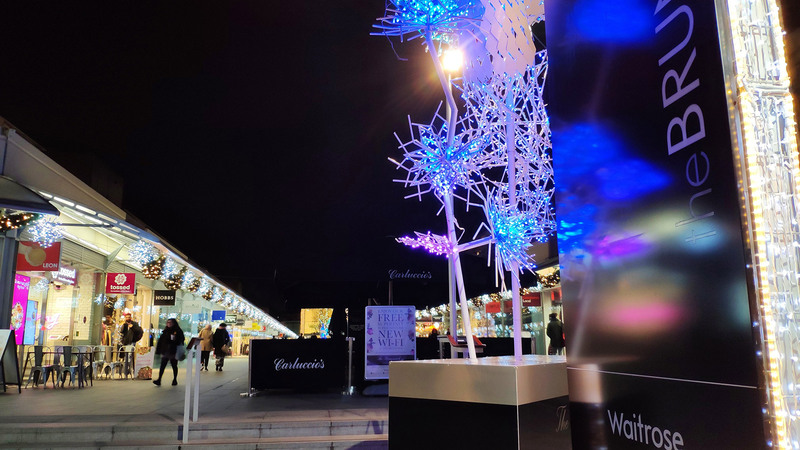 The video displays are very bright, dynamic and attractive, making the most of the limited assets Stern and Ka-Pow were allowed to use. There are some performance video clips but largely it is news coverage and camera-moved over single or montages of stills. It doesn’t feel lacking in content and the in-house animations are very nicely done. 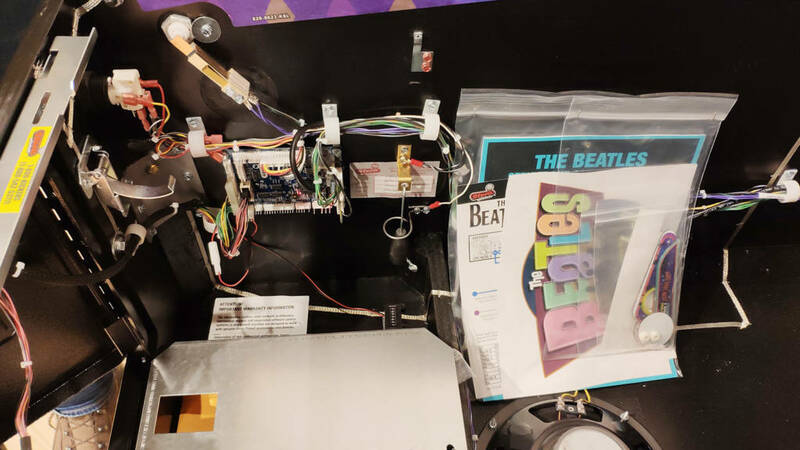 The scoring is shown on digital score reels. 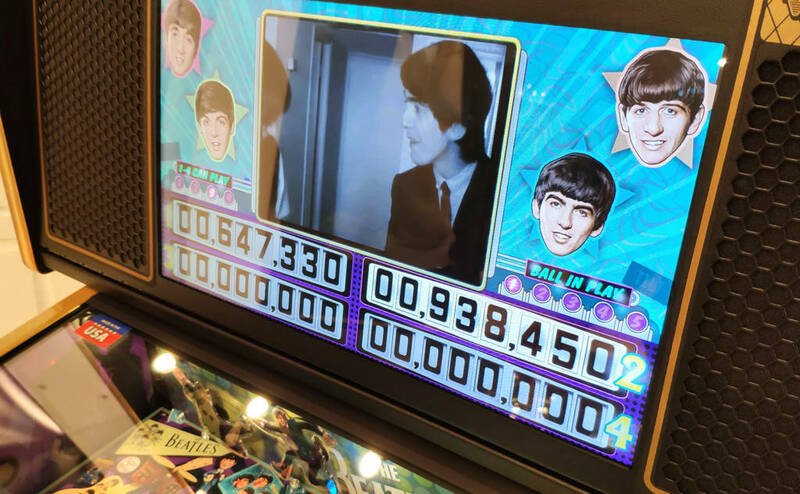 For one or two players a corresponding number of sets of score reels are shown. 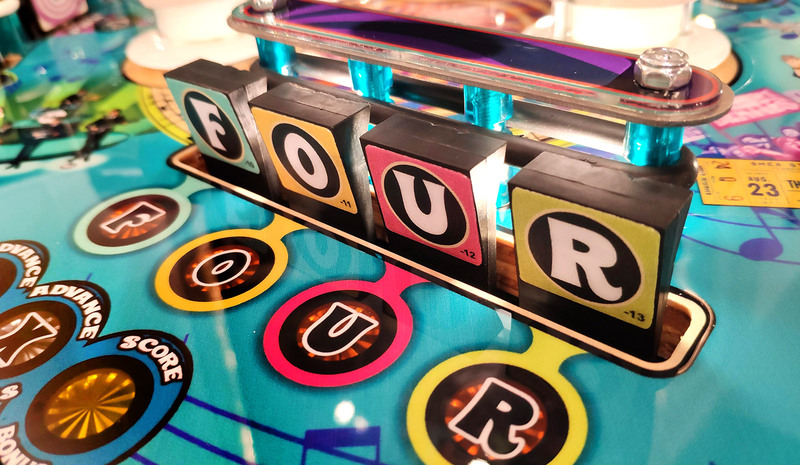 Go up to three players and you actually get four sets with the fourth set unused. 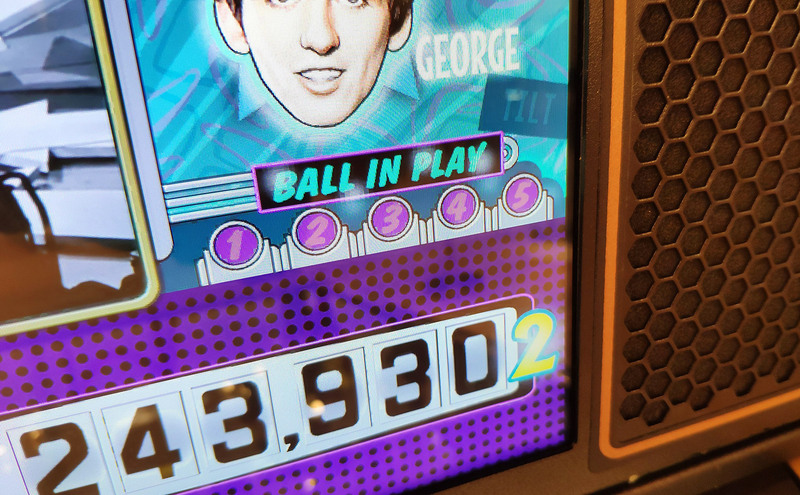 The number of players and the ball-in-play indication is done, old-school, with ‘illuminated’ numbers on the LCD. 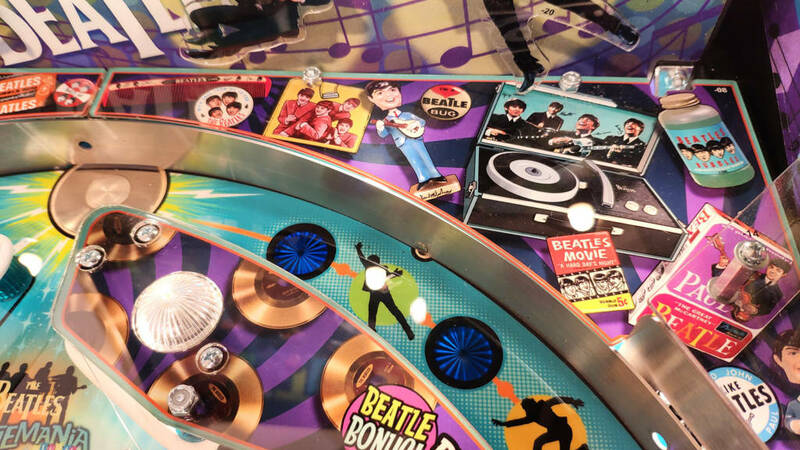 That leaves only one part of the game we haven’t examined, so let’s lift the playfield and see how it’s built. 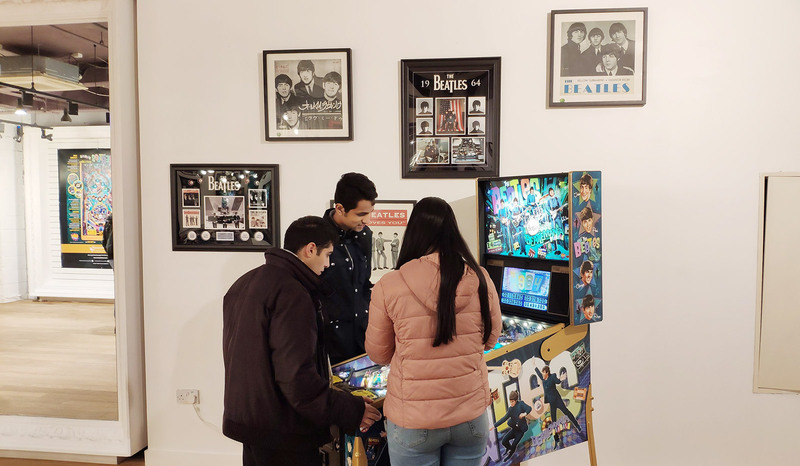 That look under the playfield brings us to the end of this report from the Beatles pop-up store at the Brunswick Centre in London. 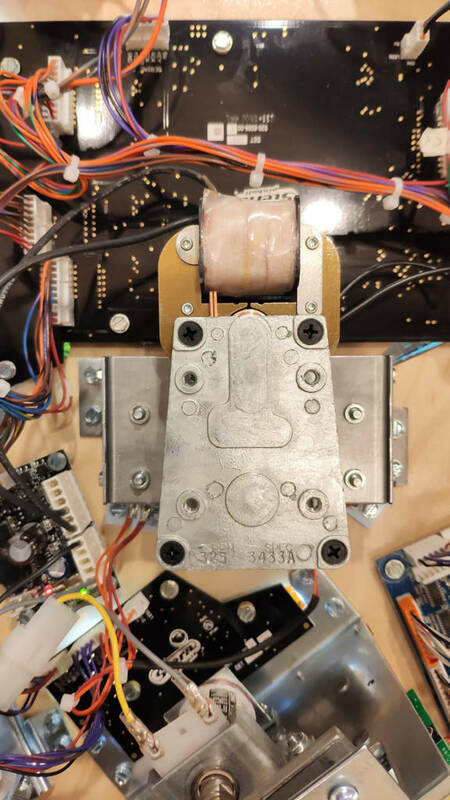 Many thanks to John and the whole Electrocoin crew for their help. 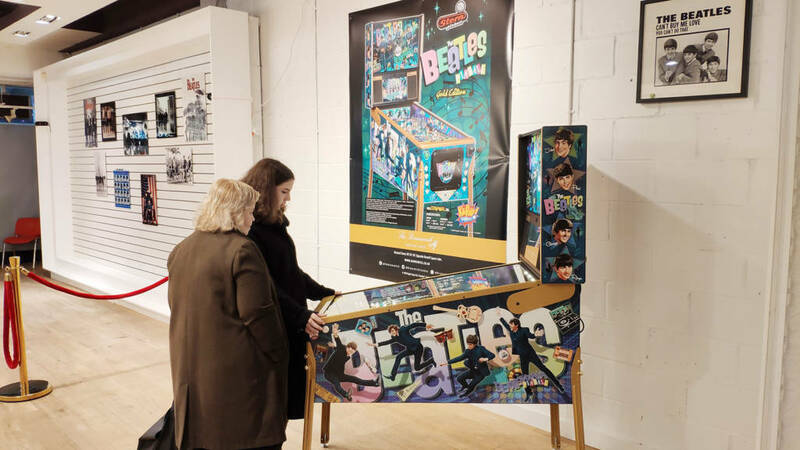 Don’t forget, you can visit the Beatles store up until 12th December and play The Beatles: Beatlemania Pinball for free.